This year, for the majority of Christians, 21 April is Easter Sunday, one of the most important dates in the Christian calendar. Although Easter is a is a festival celebrating the resurrection of Jesus Christ from the dead, it is also widely marked by non-Christians in the UK, particularly as there are two very welcome public holidays on the preceding Friday (Good Friday) and the following Monday. 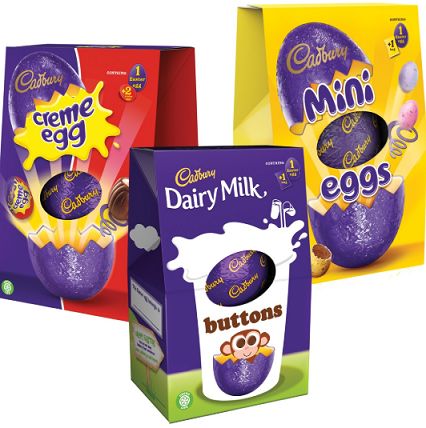 In the UK, as in many other countries, chocolate Easter Eggs and Easter Bunnies are bought by much of the population regardless of their religious beliefs. Easter Sunday is a movable feast, so the day on which it occurs varies from year to year. This means that other dates linked to Easter also vary. The day before Lent begins, 47 days before Easter, is called Shrove Tuesday. It is commonly called Pancake Day in the UK, as sweet pancakes were traditionally made to use up the rich foods in the household before the time of abstemiousness began. It is probably fair to say that most people now enjoy the pancakes with no intention of giving up luxury foods at all! In some other countries this day is known as Mardi Gras, and is celebrated with parades and festivals. In the UK Mother’s Day is the fourth Sunday in Lent and is therefore always three weeks before Easter Sunday. Although interestingly in the US, a secular Mother’s day is celebrated on the second Sunday in May. Early Christian decision makers in the fourth century established that Easter would be held on the first Sunday after the first [ecclesiastical] full moon occurring on or after the [Northern Hemisphere] spring equinox, which they assumed to always take place on March 21, and this definition still holds true today. There are two interesting features of this definition. The first one is that as discussed in a previous post the exact date of the spring equinox isn’t always March 21. It varies from year to year and also from place to place on the Earth. The second point is that the full moon used to calculate the date of Easter is the ‘ecclesiastical full moon’, a calculated full moon based upon a rather complicated set of rules which have been developed and refined over centuries to approximate the phases of the Moon. The date of the ecclesiastical full moon can be up to three days out with respect to the date of the real full moon. On what dates can Easter occur? Using these rules Easter can occur on any date between March 22 and April 25, a total of 35 possible dates. If the full moon were calculated to fall on March 21 which happened to be a Saturday, then Easter would fall on March 22. If the full moon is calculated to fall on April 18 which happened to be a Sunday, then Easter would fall on April 25. 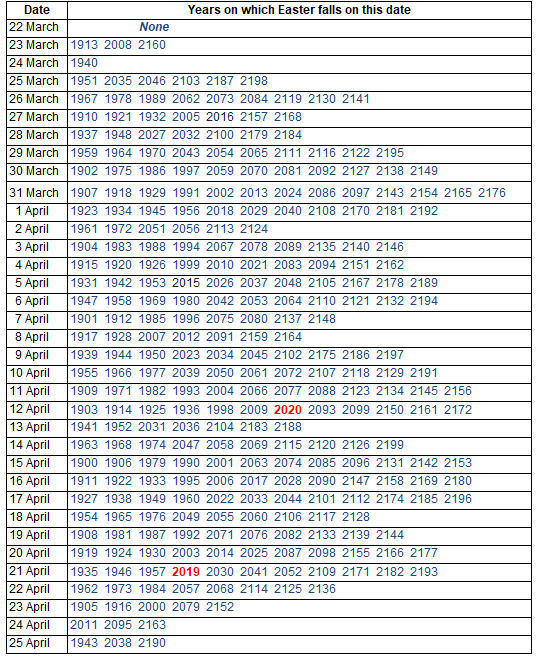 The table below lists all the dates on which Easter has fallen, or will fall on, for all years between 1900 and 2199. The main problem caused by the date of Easter varying from year to year is that it can cause difficulties of co-ordination with the civil calendar. For example, in the UK, schools normally have a two week break around Easter. If Easter falls very early or very late in a particular year this can cause the lengths of the school terms to be unbalanced. In 2008 when Easter was exceptionally early (it fell on March 23) many schools closed just for the two days either side of the Easter weekend and had their two-week spring holiday in April. To address the practical problems of Easter varying over a wide range of dates, there have been attempts to redefine the date of Easter so that it occurs over a narrow range. Over 90 years ago in the UK the Easter Act 1928 was passed. This legislation sets the date of Easter to be the first Sunday after the second Saturday in April and would mean that Easter would always fall within the date ranges April 9 to April 15. Although this act remains on the statute book no UK government has ever tried to implement it (The Guardian 2011). As mentioned in my earlier post Christmas Day – December 25th or January 7th? , most Orthodox churches still use the Julian Calendar and will not accept a calendar which they see as being imposed by the Catholic Church. The Julian Calendar lags 13 days behind the Gregorian Calendar, the civil calendar used by almost every country in the world. 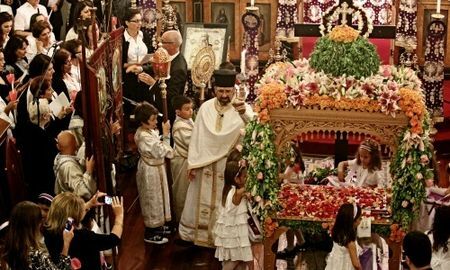 Orthodox Churches use the same rule that Easter takes place on the first Sunday after the first ecclesiastical full moon occurring on or after March 21. However, they use March 21 in the Julian Calendar which is equivalent to April 3 in the Gregorian calendar. This, coupled with the fact that the Orthodox churches use a slightly different way of calculating the ecclesiastical full moon, means that, in most years, Orthodox churches celebrate their Easter on a later date than other Christian denominations. This year they will celebrate Easter on April 28 and next year on April 19. Another point – should Easter have been on March 24? As discussed earlier the ecclesiastical full moon rather than the real full moon (as determined by astronomical observations) is used when calculating the date of Easter. 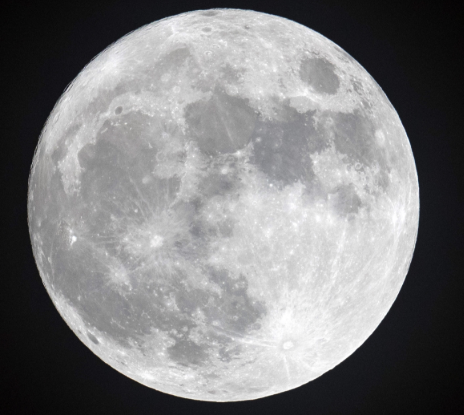 If the real full moon had been used instead, then in 2019 Easter would have fallen on March 24. This is because the first full moon on or after the spring equinox fell on March 21. The full moon on March 21 2019. This was also a super-moon; the Moon was only 360,000 Km from Earth. I hope you have enjoyed this post and I wish all my readers a great Easter break. To find out more about the Science Geek’s blog, click here or at the Science Geek Home link at the top of this page. The Guardian (2011) Unthinkable? Implement the Easter Act 1928, Available at:http://www.theguardian.com/commentisfree/2011/apr/16/unthinkable-implement-easter-act-editorial (Accessed: 23 March 2019). On Good Friday we go to France for Easter holidays. On Sunday we have one egg each because in France one egg is un oeuf.